In recent times, many ways are available for earning online. Among these, affiliate marketing is a fabulous way and one of the trendiest methods. To make money online through affiliate marketing is competitive, but if correct methods and techniques are applied, it is a lucrative way of making huge money online. So, can you earn money from affiliate programs? Well, the answer is yes and no. Of course, there is money in affiliate marketing, but whether you would be able to make money from it or not, depends mostly on other factors such as your techniques, knowledge and working experience, skills, commitment, etc. Now the question comes, what is affiliate marketing? 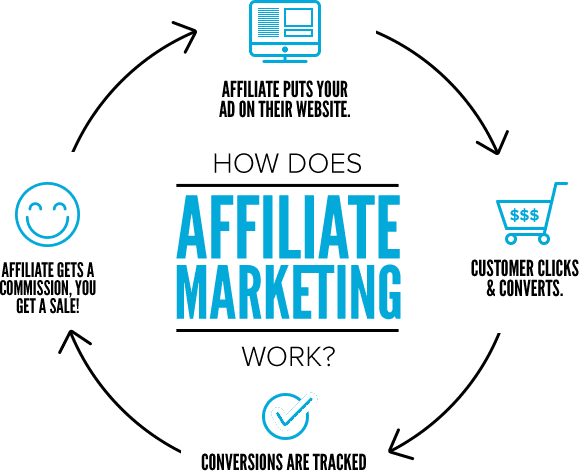 Affiliate marketing is a means to earn money online by promoting the products of other people or companies in exchange for a commission on the generated sales. It is perhaps one of the cheapest (but not the easiest) and also a fast method to start making money online. An affiliate marketer links up a buyer and a seller and gets a commission on the sale that has been referred by him/her. Based on performance: Affiliate marketing is mainly based on performance, and for this reason, it has earned so much popularity so far. Frequently it happens that the site, on which the advertising is being displayed, doesn’t get a single penny from the advertising company without any proof that Internet traffic has been driven to the site. Nowadays, the affiliate networks use very advanced tracking software. So there is no chance of tracking error. Cost effective: As affiliate marketing requires low startup cost or almost no cost at all, it is easy to start. Signing up is free for nearly all affiliate programs. Full support from the affiliate networks: A full range of advanced marketing tools, tracking, and reporting technologies is provided by most of the affiliate marketing networks. Some systems, even provide web contents along with personal support to meet the needs of their affiliates and clients. Variety of products: A wide range of products are available for the affiliate marketers to choose. It can be beauty, health, food, magazines, video, self-improvement, membership, green products, electronics, automobiles, fashion, clothing, etc. Affiliate marketers can choose any product depending on their passion. Global market: Affiliate marketing provides the chance to reach people globally. Passive income: A regular job can provide a fixed income if anyone continues to work. But they depend on the promotion skill; an affiliate marketer can build up a stable flow of income even when he/she is not in front of the computer. Work from home: By doing affiliate marketing, people can work anytime in the environment and comfort of own home. 1 How Do Affiliate Programs Work? So, how does affiliate marketing work? After signing up with an affiliate program and selecting the products for selling, sellers provide the affiliate marketers with a unique code that they can use to refer traffic to the target site. Ready-made text links, banners and other forms of original copies are offered by most of the affiliate programs. The affiliate marketers only have to copy the code and place it on their websites to start referring traffic. When the visitors get interested, they click on these links of those websites, and they get redirected to the product site. If any visitor purchases a product or subscribes to a service, the affiliate marketers get a commission as the referrer. The sellers track the performance of the affiliate marketers through their affiliate ID and the affiliate marketing software they use. The affiliate marketers also have complete real-time access to the statistics of all sales and commissions. Pay Per Sale (PPS): In a Pay-Per-Sale system, the publisher or website owner gets paid by the number of sales that are directly generated by an advertisement. It is also known as Cost-Per-Sale (CPS). Pay Per Click (PPC): In this payment method, the affiliate marketer gets paid based on the number of visitors redirected to the advertiser’s website from the affiliate site, whether or not a sale is made. It is referred to as Cost-Per-Click (CPC) also. Pay Per Lead (PPL): In this type of program, the advertiser pays the affiliate marketer depending on the conversion of leads, such as completion of a sign-up form for a newsletter, email submission, e-book download, software or file download or other desired action. PPL is also referred to as pay per action or Cost Per Lead (CPL). To promote affiliate products, creating a niche website or blog is one of the most effective ways. The affiliate marketers should choose a topic that interests them most and that they are passionate about. Then they should find product offers that match that topic. In affiliate marketing, the right merchant should be chosen. It’s because when a product is promoted, the person or the company who is behind the product also gets improved. If some visitors buy products through an affiliate site and gets dissatisfied with the quality of the product or service, apparently there is no chance that those visitors will come back again. This can hurt the credibility of the affiliate marketer and the site in the long run. Generally, websites or companies that offer excellent customer service will have better customer satisfaction. So, it is better to stick to promoting their products. Registering with too many different affiliate programs and trying to support everything is the first mistake a lot of affiliate marketers make. Following this path can become very overwhelming, and it is not possible to promote any product properly in this way. All that is needed is many good affiliate marketing products to promote. It is essential to understand the market needs and look for products that go with the topic or niche of the affiliate website. It is always best to spend a bit of time researching and finding out the demand for the product. If a product that is in low order, then chances are that no matter how much effort is given, it is not going to get many sales. It is wise to conduct an online survey or market research and easily get input from visitors about the product. Only putting up ads on the affiliate websites is not enough for getting traffic. Most affiliate marketers follow this approach. But it should be kept in mind that there are also other affiliate marketing traffic sources for getting visitors and promote the products simultaneously. The more targeted traffic goes to the sales page, the more chances of making money. Well, to generate more traffic, there are several ways, including free and paid advertising methods. Starting the business as a newbie, you may not have a massive budget for the paid options. So, it is a good idea to follow the free traffic generation methods. The big question that arises then is how to generate free traffic to affiliate sites. Search for the Right Merchant: It is good to experiment with various merchants to bring needed success in affiliate marketing. But before deciding on, it has to be confirmed that these merchants are related to the website niche. For example, if your website is for promoting real estate, positively it should help offers from construction, architects, banks, security agents, etc., who would want to use your website as a platform to drive traffic to their sites. Prepare Quality Content: A meaningful content is an excellent appealing factor to the audience or visitors of a website. Only quality content can attract people, and of course, the clicks come from the people. Moreover, a merchant would select a site over another competitor’s website, if it has good content. Stay Even with the Algorithm: This year, affiliate marketers should keep pace with Google’s updated algorithm to generate traffic to their sites. Though it’s tough to stay even with the ever-changing algorithm, to keep up with Google, it’s necessary to take on a few modifications in the keyword selection. It’s best to stick to long tail keywords that best define the products or services and also present unique features. Use Audio and Video elements: Nowadays, using audio and video elements in the contents is considered as smart representation. It is an effective way to generate curiosity among the visitors and get instant feedback from them. Stay Updated and find the niche-audience: A successful affiliate website is one which can attract tons of traffic and can see the niche- audience from them by approaching them with targeted messages. Staying updated on real-time news and events related to the website niche is helpful for increasing niche related traffic to the site. Email Marketing: Identifying the target audience and building up effective communication through email is an excellent way to get more traffic for affiliate marketing. Emails should be written in such a manner that it compels the user to read the material and visit the merchant’s website. An effective affiliate marketing email campaign can be initiated by making a subscriber list using a landing page. Offer Bonuses: It is always better to offer something extra to the buyers. It can be a free subscription or a gift for the customers or a bonus. But it should be remembered that a freebie works only when it becomes useful to the buyers. While selecting the bonus offer, take into account that it should satisfy customer expectations and also match the products or services that are being sold. Well, I hope that this short list will give you some ideas regarding paid traffic sources and help get started. To use various product promotion strategies is an excellent idea to figure out what is working and what is not. Testing should be done separately with each affiliate marketing campaign. Then the performance of each campaign should be measured, and action should be taken accordingly. It is possible to increase the profit level by just changing a few things here and there. The necessary tools and software are provided by most of the affiliate programs, but there is other affiliate conversion tracking software out there. It is also good to use those to track affiliate campaigns. In the field of Affiliate marketing, people are always coming up with new methods and ideas. It is a competitive arena. So, it is essential to stay current with new techniques and market trends. Otherwise, there is a possibility to fall behind. There are various forums or online communities for affiliate marketing such as Digital Point, aBestWeb, Warrior Forum, etc. where people exchange their views and ideas. Join at least one affiliate marketing forum to get benefited from experience, knowledge, and advice shared by other newbies and experienced affiliates. In a nutshell, reading and learning are a must work to make money online through affiliate marketing. Study about the techniques and strategies and collect essential tools and resources. Proceed with a structured plan and set up everything in a proper manner. But before that, of course, choose a niche about which you are passionate. The more you genuinely enjoy what you are engaged in, the more likely you are to transform your money-making endeavor into a huge success.